The Holy Spirit Is Not A Person! The Holy Spirit Is An It! DISCLAIMER: As mentioned on my other web sites and pages, I do not espouse to all of the beliefs expressed on the reciprocal links I have provided here. My web sites are a venture into the pros and cons of diverse aspects of religious beliefs. I leave it completely up to each individual to decide what is truth and what is not. I am also not responsible for any cost or donation purchases that are made through these links. These reciprocal links are purely for educational and research purpose only. Please view these links at your own discretion. Would you like to be a feature link at the top of this page? E-MAIL ME with your request and I will get back to you ASAP. Regarding The Father, Son & Holy Spirit. An exhaustive verse-by-verse, side-by-side comparison of the four major historical paradigms. What is the Soul and Spirit? Who Is Wisdom in Proverbs 8? The Holy Spirit is referred to as he and him in translation. This is also true of common tools, etc. "Then said Yahshua unto him, Put up again thy sword into, his place, for all they that take the sword shall perish with the sword" (Mattithyah [Matthew] 26:52; also cf. Yechetzqyah [Ezekiel] 21:3-5, 30). The word 'house' is personified in translation in Yeremyah [Jeremiah] 22:14. The word 'candlestick' is personified in Revealtion 2:5. The word 'ordinance' is personified in translation in Exodus 13:10. 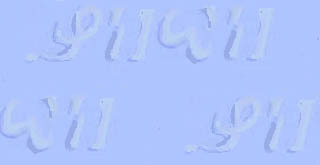 The word 'patience' is given a female personification in translation in Yaaqob [James] 1:4. The word 'wisdom' is also given a female personification in Proverbs 1:20; 9:1 & 31:26. Many people assume that the Holy Spirit is a personal entity, based on references to the Spirit as "he," "him" and "himself" in the New Testament. This confusion arises from two factors—the use of gender-inflected pronouns in the Greek language and bias on the part of some translators. Greek, as do the Romance languages (Spanish, French, Italian, etc. ), invokes a specific gender for every noun. Every object, animate or inanimate, is designated as either masculine, feminine or neuter. The gender is often unrelated to whether the item is indeed masculine or feminine. For example, in French the word livre, meaning "book," is of the masculine gender and is referred to by a pronoun equivalent to the English "he." And in Spanish, mesa, or "table," is in the feminine. Clearly, although these nouns have gender, their gender does not refer to actually being male or female. In the English language, in contrast, most nouns that do not refer to objects that are male or female are referred to in the neuter sense, with the pronoun "it." In Greek, both masculine and neuter words are used to refer to the Holy Spirit. The Greek word translated "Helper," "Comforter" and "Advocate" in John 14-16 is parakletos, a masculine word in Greek and thus referred to in these chapters by Greek pronouns equivalent to the English "he," "him," "his," "himself," "who" and "whom." Because of the masculine gender of parakletos, these pronouns are grammatically correct in Greek. But to translate these into English as "he," "him," etc., is grammatically incorrect. By the same token, you would never translate a particular French sentence as "I'm looking for my book so I can read her." While this grammatical construction makes sense in the French language, it is wrong in English. Thus the supposition that the Holy Spirit is a person to be referred to as "he" or "him" is incorrect. There is absolutely no justification for referring to the term "Holy Spirit" with masculine pronouns, even in Greek. The Greek word pneuma, usually translated "spirit" but also translated "wind" and "breath," is a grammatically neuter word. So, in the Greek language, pronouns equivalent to the English "it," "its," "itself," "which" or "that" are properly used in referring to this word for "spirit." Yet, when the King James or Authorized Version was produced (early in the 1600s), the doctrine of the Trinity had already been accepted for more than 1,000 years. So naturally the translators of that version usually chose personal rather than neutral pronouns when referring to the Holy Spirit in English (see, for example, John 16:1314; Romans 8:26). Notice, however, that in some passages in the KJV the translators properly used neuter pronouns. Romans 8:16, for example, says: "The Spirit itself [not himself] beareth witness with our spirit, that we are the children of God." 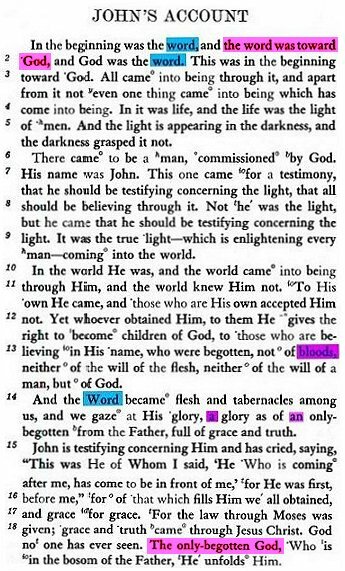 Matthew 10:20 and 1 Peter 1:11 are other places in the KJV where the proper neuter pronouns are employed. Regrettably, later English translators of the Bible have gone even further than the King James translators in referring to the Holy Spirit as masculine rather than neuter. Thus the Holy Spirit is almost always referred to as "he" or "him" in the more-modern versions. This reflects not linguistic accuracy, but the doctrinal bias or incorrect assumptions of Bible translators. The "Holy Spirit" is the power of Father Yahweh and His spirit is not a seperate person. If one is under the inSPIRation of Yahweh's spirit they would be agreement with His Teaching (Torah, Law). Note that Shaul said that the Teaching (Torah, Law) of Father Yahweh is spiritual. Yahshua was under the inSPIRation of Father Yahweh's set apart ("Holy") spirit. He was in obedience to Father Yahweh's Teaching (Torah, Law). He was without sin, and sin is the disobedience of Father Yahweh Teaching (Torah, Law) as stated in I Yahchanan [John] 3:4. I would suggest that you read and study this passage in the entire context from which it was taken. We are also to be under the inSPIRation of Father Yahweh's Teaching (Torah, Law). This is true righteousness. If we are under the inSPIRation of Father Yahweh's Spirit we will obey Him as also did His son Yahshua. The Teaching (Torah, Law) that Yahshua taught was not his own, but that of Father Yahweh. Note also that the spirit is part of the WHOLE armour that we are to be equipped with to fight off the wiles of the devil (evil). If one is not fully equipped with the WHOLE armour of Father Yahweh they are under the inSPIRation of Satan the devil. WRONG spirit as opposed the RIGHTEOUS Spirit of Father Yahweh. "For we know that the law (the Teaching [Torah] of Father Yahweh) is SPIRITual ..." (Romans 7:14). Put on the whole armour of Yahweh, that you may be able to stand against the wiles of the devil (Ephesians 6:11, 13). "... and the sWORD of the Spirit, WHICH IS THE WORD OF YAHWEH (Ephesians 6:17). And it shall be our righteousness, if we observe to do all these commandments before Yahweh our Mighty One, as He has commanded us (Deuteronomy 6:25). Father Yahweh Is Not His Son Yahshua Whom He Anointed, Appointed As King To Reign For 1,000 Years And Raised From The Dead. http://www.freewebs.com/frank4yahweh/index.htm The Diverse Trinity Doctrines Are Not The Teachings Of Father Yahweh! They are the teachings and "private interpretations" of mere men are not under the inspiration of Father Yahweh. KNOWING THIS FIRST, that no prophecy of the scripture is of any private interpretation (2 Kepha [Peter] 1:20). 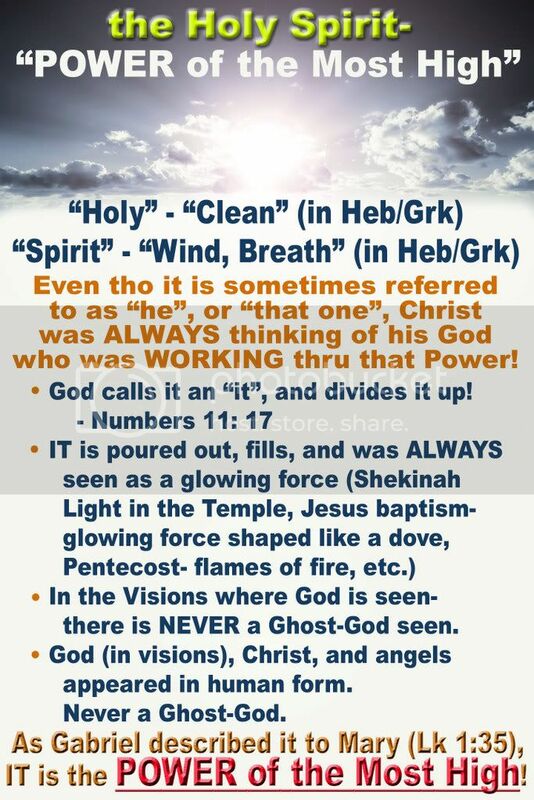 Yahweh's Set Apart ("Holy") Spirit Is Not A Person! Holy spirit - and translations using the pronouns "he" and "him"
What is the "Holy Spirit"?